As a special Halloween Guest, Denise from Flour and Sun Bakery has made you some Bloody Brains! It’s quite the Halloween speciality! Hi, my name is Denise and I own Flour & Sun Bakery, a boutique bake shop and dessert catering company located in Pleasantville, NY specializing in unique, elegant, and creative desserts. While we are known for our award-winning cupcakes with our ever-growing menu of over 150 flavors, our other popular dessert offerings include cake pops, cakes, decorated cookies, whoopie pies, and more! 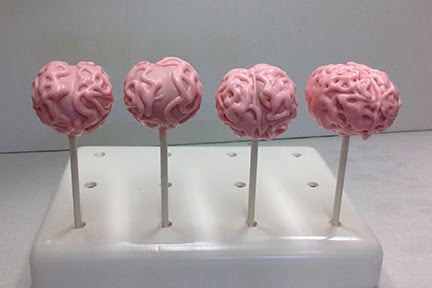 Perfect for Halloween or any zombie gathering, these bloody brain cake pops are a fun treat that is sure to make people gasp in horror! Use your favorite cake pop recipe. Make the standard cake pop ball and re-shape it into an oval. 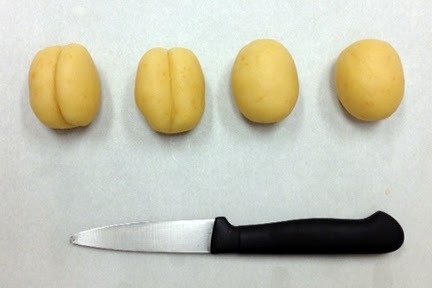 Create the hemispheres of the brain by using a small knife to make the indentation. Chill it until you are ready to dip into the chocolate. Get your melting chocolate ready for dipping and decorating. In short increments, slowly melt your white chocolate in the microwave. When smooth, set aside about 1/4 of the chocolate to use for your “blood.” Use a few drops of oil-based pink food color and mix thoroughly until you get a light pink shade. In the other bowl with the smaller amount, add oil-based red food color to transform it into blood. 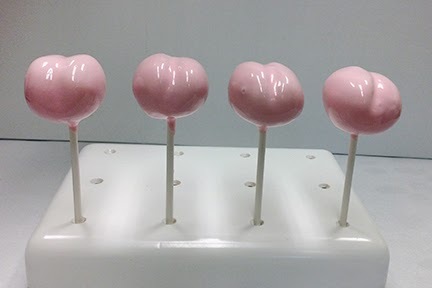 Dip your lollipop stick in the pink melting chocolate and then into the bottom of the non-indented side of your cake pop. 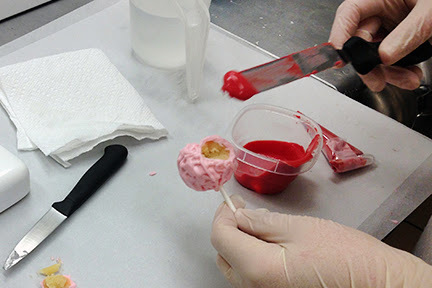 Once completely set, dip the cake pop into the pink chocolate until it is covered. Tap it carefully so all the excess chocolate falls off. Let it set completely in a cake pop stand or styrofoam block. Using a small disposable pastry bag with a number 4 or 5 tip, drizzle pink squiggly lines all around one hemisphere. Be sure to leave gaps and let those dry and then repeat. The goal is to see the ridges. 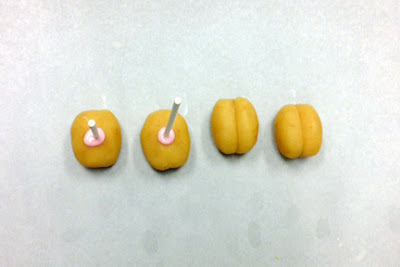 With a hot knife (dip the knife in hot water and then dry off) cut into the chocolate and expose the cake pop. Fill in the hole with red chocolate with a small offset spatula. Using a small disposable pastry bag with red chocolate and a number 4 or 5 tip, add some additional red chocolate around the brain to represent the splotches of blood. We just released our first ebook, Four Spooktacular Halloween Treats which is available to download for free. We also offer a wide selection of Halloween cupcakes, cookies, and cake pops! We ship our cake pops and cookies nationwide.